Food is very much part of the Filipino culture. If you go to a Filipino house, you’re going to eat whether you like it or not. Once you step into a filipino home, some of the first words you hear are, “Are you hungry? Come and eat!” If you stay for a few hours, you’ll probably get a meal and a snack. Most people know about lumpia, which is basically a Filipino eggroll, and pancit, a noodle based dish. But very few people are willing to try other dishes. If you go to a Filipino restaurant, it’s easy to find lumpia and pancit along with the dish, Pinakbet. I don’t think I liked Pinakbet when I was younger, but as I got older I became more adventurous with the things I ate. It’s now one of my favorite Filipino dishes, so I’m happy to share it with you. But what exactly is Pinakbet? There’s no English translation for this dish, but it’s basically vegetables cooked in fish sauce accompanied with pork, fried fish, or shrimp. It’s from the northern region of the Philippines and a widely prepared Ilocano dish. It’s one of the dishes that has been passed down from generation to generation. My mom learned from my Apong (grandma) and she makes it so often, that I feel like I would be able to pass it on to my future children. It’s a fairly easy dish to make. My mom tells me that it’s something her family used to cook all the time because vegetables were easily accessible. They didn’t have a fridge in their home in the bukid (farm or field), so they just harvested vegetables in the field and cooked it for the day for the whole family. If it was anything like now, they were cooking for a huge family. First, prepare the vegetables. Wash and peel the vegetables before slicing them up into small cuts. As for the shrimp, no need to have the peeled. Cook them as they are to get added flavor. 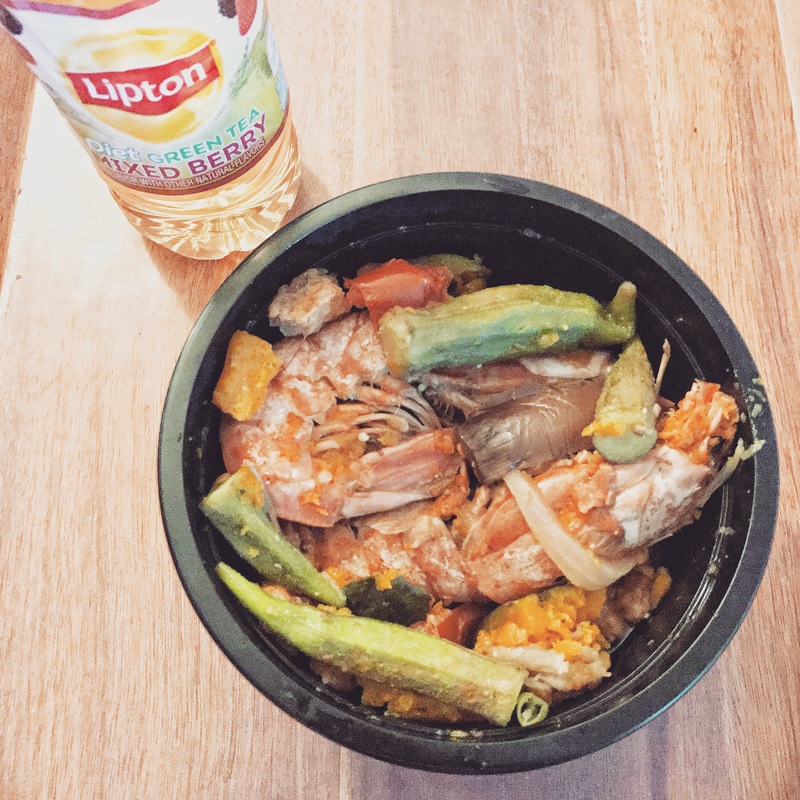 After you prepare the shrimp and vegetables, place it all in a stockpot. Pour the fishsauce according to how salty you like it! I’m not really helpful with measurements, but you can always wing it and do trial and error. Then add water, a little less than how much fishsauce you added. My mom usually goes with one bottle of water. Don’t forget to add the chicharon as well! Let it cook until the vegetables are shrunken/shriveled – an hour is usually good. That’s where the name Pinakbet comes from. Apparently, that’s the Ilocano translation. I’m not much of a fan of bittermelon, so I usually put it aside, but my favorite part of the dish is the kobucha. I could eat it all day! 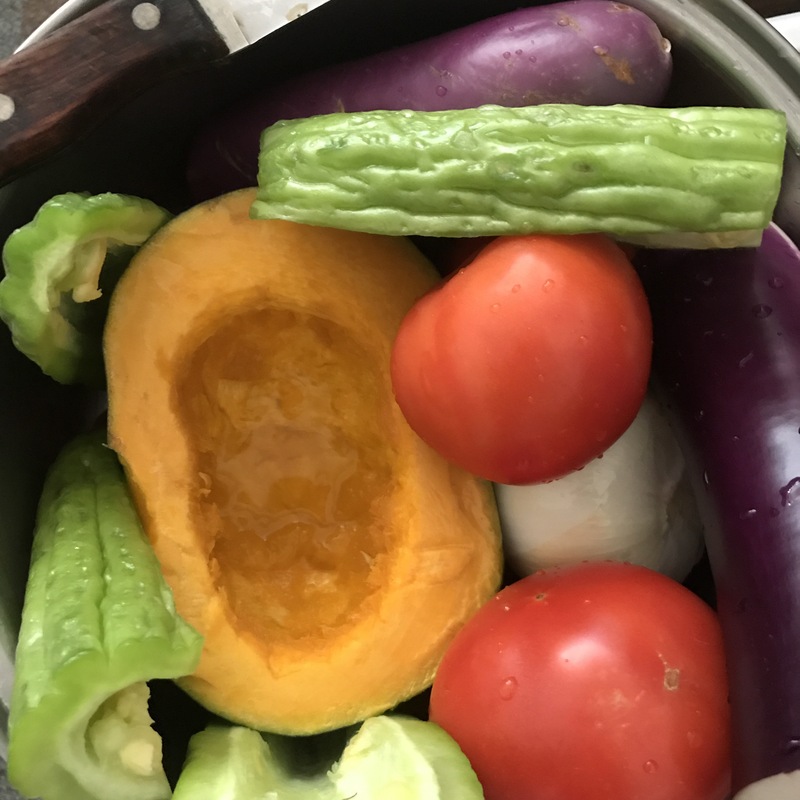 This entry was posted in A blog a day August 2017, Personal and tagged blog, challenge, Filipino, food, lifestyle, love, Personal, Philippines, Pinakbet, random, recipe, writing on August 21, 2017 by Adele Fredeluces.